Dickens’ Days – an annual event of Victorian decorations and dress, caroling, roasted chestnuts, and this year, murder. The tyrannical Days Coordinator stops at nothing to fulfill his goals. Until death halts him in his tracks. Katie Sheridan’s best friend Ginger and Ginger’s mother top the suspect list when the victim is found outside their home. The weapon? A potpourri of toxic holiday decorations. No one railroads her friends, so Katie begins snooping. Detective Dirk Johnson believes keeping Katie safe is difficult even when he’s at her side, but breaks up with her to keep the lead investigator position. He must solve the case within days or turn the file over to a detective with less experience and a direct connection with the mayor. Will small-town politics allow a killer to go free or will Katie and Dirk find a Christmas miracle? DICKENS OF A DEATH by Ashantay Peters is a perfect holiday story for any lover of mystery and romance. As a native North Carolinian, I fell in love with the setting of the story as the fictitious mountain town of Granville Falls, North Carolina. DICKENS OF A DEATH is Peters second holiday mystery featuring Granville Falls. Both books have the same characters, but may be read as stand alone novels. I enjoyed everything about DICKENS OF A DEATH. In addition to the fantastic setting, it had an intriguing plot. Christmas in Granville Falls includes a traditional holiday home tour called “Dickens’ Days.” Visitors may tour historical homes and locations around town and the tour guides and hostesses are dressed in period costumes. The organizer of “Dickens’ Days” is quite overbearing for the other volunteers involved. He manages to annoy many people around town and soon becomes a murder victim. Our heroine, Katie Sheridan, her best friend Maggie, and Maggie’s mother, are at the top of the suspect list. Katie works with her hunky cop boyfriend, Dirk, to clear their names and find the real killer. 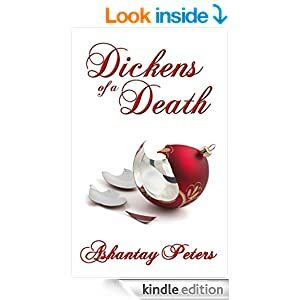 Yashantay Peters created very realistic main characters in DICKENS OF A DEATH. Katie and best friend Maggie, have the type of long-standing friendship everyone wants. They would do anything for each other and support each other unfailingly. Katie’s boyfriend, Dirk, is a handsome police officer and there are several steamy scenes between the two. I hope that Peters continues writing holiday mysteries featuring these characters. I would love to see how the romance between Katie and Dirk progresses. Also, I would like to see what Katie and Maggie get involved in next. At the end of DICKENS OF A DEATH, Katie vows to be out of town for the next annual ‘Dickens Days.” She and Dirk are planning a ski trip. Maybe a ski lodge murder mystery is in the works for next year! Thank you, mjw5894, for the favorable review! I hadn’t planned on writing another Christmas mystery, but now…well, I guess I’d better. A ski trip for Katie and Dirk? Hmmm. Possible. Quite possible. Thanks again for your positive comments!